Pre-coeliac diagnosis, I used to make cannelloni using either the dried pasta tubes you can buy, or latterly by rolling them up in fresh lasagne sheets. Neither of these were totally satisfactory as the tubes were always too small and fiddly, and the lasagne sheets generally split. So it’s been on my mind for a while to test out the pancake method. My favourite cannelloni filling is a spinach and ricotta one I’ve devised myself, but it can also be stuffed with a meaty filling. The method for this is a bit time consuming, and best made in advance, but the joy of having a wonderful pre-prepared comforting dish to simply heat in the oven more than makes up for it. I made this stretch to 10 small pancakes, but I think next time I’d make them thicker and either make 6 or double the mixture. Once cooked, I separated the pancakes with greaseproof paper to avoid them sticking to each other. I softened the onion and garlic, added the tinned toms, stock and oregano, and let it simmer down until reduced by about half. A bit of seasoning then this went into two Pyrex dishes. I also made about a pint of bechemel sauce, by my very simple method of making a roux with plenty of butter and flour, and adding milk to thicken, along with a couple of bay leaves to infuse while the milk heats up. I left this to cool, stirring regularly to avoid it making a skin. When rolled, these were placed in the tomato sauce, ready for a covering of the bechemel sauce and a generous sprinkling of parmesan. To bake straight from the fridge, they took about 35 mins at 180C. They very much lived up to their expectations, and the pancake was very easy to work with, albeit a bit on the thin side. 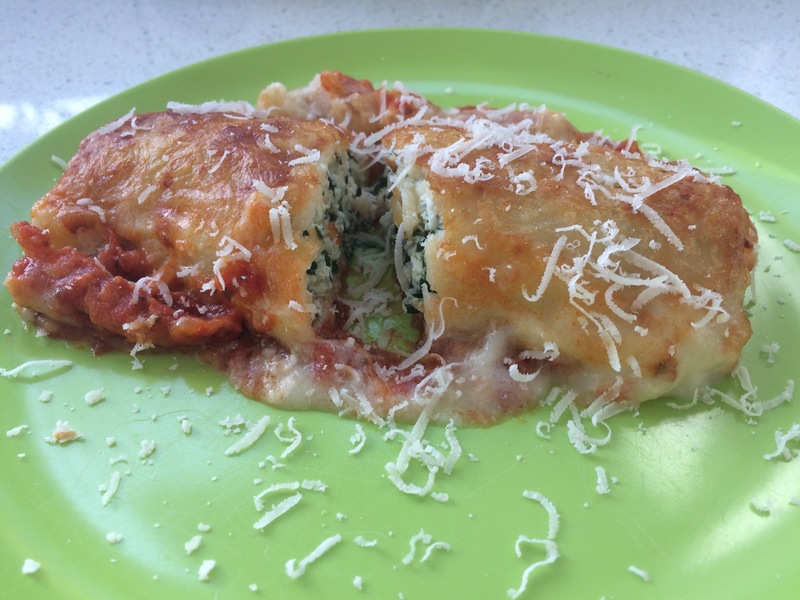 Tags: gluten free cannelloni, home made cannelloni, pancake cannelloni, spinach and ricotta. Bookmark the permalink.